It seems an odd thing to add to the BMPD project given that Anomalous Materials is already pre-Disaster, but I was getting some interest in this when I mentioned it in other threads so I thought I’d make it official. A while back I used Anomalous Materials as a base with which to demo some of my techniques for ambient interior lighting, and actually took a liking to the end result, to the point where I went ahead and did the entirety of bm_c1a0a in that style. In the process I also opened up some of the labs that the player cannot get to in the vanilla map version. A long time ago, SB776 (the guy who did the Lambda Complex PD) and I talked about making a version of AM with a working, non-Resonance-Cascade-causing anti-mass-spectrometer, so I decided to run with that and include it along with documents and connection to the pre-disaster transit system. Expect more to be filled out on the details of this project as I get it ready to show- most of the geometry of pd_c1a0a is actually already done, but there’s a good bit of logic still left to do and since this was originally his idea I was planning to see if SB776 was still around and if he had any suggestions. Shouldn’t this be AM/Inbound? It would be nice to run around the starting areas. Inbound would definitely be considered a similar but separate project- specifically, there is a Black Mesa remake of Azure Sheep which I am thinking of including in BMPD, and this will itself expand Inbound. So it would be redundant to work on Inbound before that comes out. Most of what I’m changing in this map is just the lighting, which I’ve already expounded on at length here (and will likely continue to expound on as I learn new techniques). You can get back into the tram platform through the airlock without having the security guards pass you in every single time. I thought about modifying Officer Slow-As-Balls’s scripting so he’d cross the catwalk to let you in in a more timely fashion, but didn’t bother since he only does that once and you can operate the door controls yourself after that. You can get back out of the elevator area after being let in, but you can also get in there to begin with - and indeed will be able to go all the way to the Test Chamber entrance - without the HEV suit. I know it’s a bit strange, but I always thought there was something pleasingly pre-disastrous about being able to have basically the run of all non-hazardous areas of the facility in just a comfortable shirt and kakhis and not bulky protective gear. The suit’s still available to wear wherever, of course. Freeman’s walking speed is a little slow without it, so I might include a player_speedmod as well. If I can get that to work and find it helpful I’ll put it in all the other pre-disaster maps too. It’s actually possible to take the HEV suit back off and store it back in the locker room if for some reason you want to do that. While there’s currently no place for it to go, it will be possible to use the tram system to fast-travel to other pre-disaster chapters as they are added. Similarly, if ArcHammer is still around and willing to add a transition to match, the Sector B airlock will be unlocked and able to connect the player to the coolant reserve. It’s worth noting that I’ve not opened the door at the end of the Personnel Facilities hallway, and have indeed added other locked doors in the service area that face the same direction. That’s because I believe these doors connect Anomalous Materials to the other areas surrounding the anti-mass spectrometer that we see in Decay, as I’d outlined previously here. I’m calling those other labs the “Anti-Mass Systems” department. I was in luck that bm_c1a0a separates relatively cleanly from this area, but I foresee some problems in bm_c1a0b in how much of the anti-mass systems half of the spectrometer labs I want to build out and make accessible versus how much I want to save for people working on Decay remakes- does the door to the security desk in front of the Test Chamber lead into an area seen in Decay? What about the upper lab with the catwalk over the plasma cells? I’m sure I’ll figure it out. But in addition there’s some things I know I won’t be able to do without changes being made by the developers to how Black Mesa’s code works- the HEV startup sequence graphic and some of the NPC flavor dialogue are actually tied to the map name and thus will not function on a map called pd_c1a0a as opposed to bm_c1a0a. The announcement system also has this problem, but I built a decently-functional “fake” announcement system using some timers and a crapton of ambient_generics that I can easily bring over to replace it. It might be possible to do the same with the HEV bootup, but I doubt it, and the NPC dialogue I’m pretty sure is a lost cause. I haven’t posted in one of the Pre-Disaster threads in ages, but I’ve been keeping tabs on the project - looking good as always! Judging by dialog in Decay, I’m guessing either they never got anyone for this position or they were very, very bad at their job. After all, according to Rosenberg, the fields were designed not to fail, yet they did anyway. For Test Chamber, are you planning to add some lower areas located beneath spectrometer? For example chamber for preparing samples to be shipped upwards into test chamber. Also with all equipment for manipulating with samples, radiation cleaning chamber for HEV suits, guarded storage room with labeled sample containers. Another thing that came into my mind is how the samples are transported between sectors and complexes (Lambda?). It would be weird if BM Transit System was used also for transporting specimens, which probably also need to be heavily guarded during transport and stored in special box containers to prevent contamination. So there could be probably underground railway station beneath, with some control outposts between different clearance levels. A lot of that could be considered stepping on the toes of people remaking Decay, but that doesn’t mean the ideas are in any way bad- in fact, I think they’re pretty neat. Although I don’t see why a separate high-security transit system wiuld be required, as the intro tram dialogue seems to indicate that the regular tram network is already set up for that. Determining the number of people who actually work normally in the various Anomalous Materials labs versus those who are just there for the Big Test from other areas of the facility is actually kind of a non-trivial task, as while it makes sense for each member of the research staff to have at least some kind of workstation with a computer they can use to check their emails (even undergrad volunteers get one of those in the lab where I work) there are relatively few desks with desktop computers in the development section of c1a0a and none at all in the accessible parts of c1a0b. So some of the other control terminals must serve this functionality (which indeed they seem to based on the Windows desktops visible in some screens), but if all of them do Anomalous Materials would have a lot of people in it. I considered making that whole area a ‘hazmat’ lab that various different people used but wasn’t actually staffed by any dedicated researchers, but instead decided that the laptop actually was used by a specific scientist who works in that lab and he just prefers to be able to move it around- this lab also features the only movable plastic chairs in the research area, so he probably just uses those. Putting out a sort of ‘call for papers’ to see if anyone had ideas for subjects the Anomalous Materials scientists might be researching. I already have some technical documentation drawn up showing that AM developed the high-impact reactive armor in the HEV suit (an Air Force general is writing to one of the scientists about reducing the weight and power requirements to put it on aircraft) and also the blue goop that is in all of the suit chargers and batteries (and is, in fact, ultimately Xenian in origin), and was wondering if the community had anything in particular they’d like to see included. Papers concerning the H.E.V. suits would be more suited with the lambda complex, or an unspecified area of the facility, depending if the suits are made on or off site. The Anomalous Materials laboratory is researching, well, Anomalous materials, and therefore would not be directly in the R&D loop modifications. 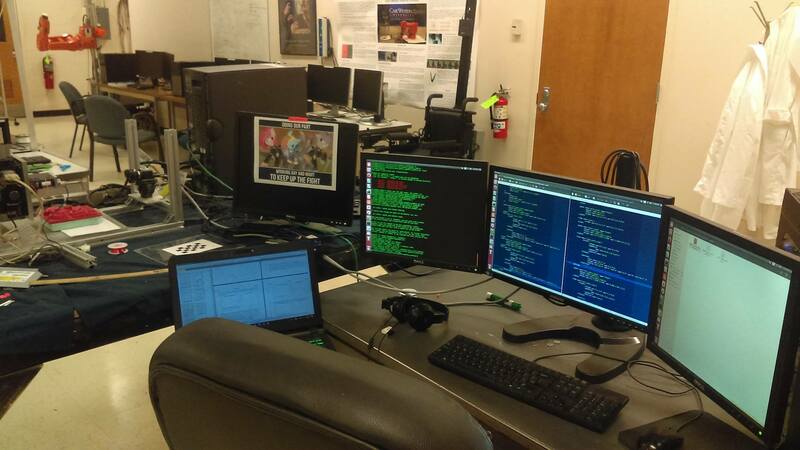 Although one scientist does rant about himself once working on the H.E.V. suit, the administration has shown to shift personnel around, with (seemingly) no regard to the specialized fields. I was basing the HEV connection on the idea that a number of unusual materials were involved in its construction and AM was responsible for developing those. Anomalous Materials scientists also did some of the theoretical background (for superhot plasmas) in the TESLA devices used throughout Questionable Ethics. Just wondering, how do you make the documents? From what you wrote in the Office Complex thread, all it says that it’s a texture. Much of the actual writing and design of them is done in LibreOffice Draw (an open-source word processor and vector graphics tool)- if you were to open up the VPK of a pre-disaster mod you would find the documents in question in the materialsrc folder. Then they are pasted onto a paper background in GIMP and given some post-processing. Typically the ‘erode’ filter makes the text stand out a little better, and a white-to-alpha effect makes the text appear to actually be inked onto the paper instead of just pasted overtop of it. For screens I’ve found that the ‘video’ and ‘softglow’ filters are helpful. The most important thing, though, is adjusting the color level of the image so no part of it is exactly 0-0-0 black (all of the black text is in fact very dark grey). This is necessary because the graphics ent in game sets 0-0-0 black to transparency. After that I make them just like any other Source Engine texture. The overlay functionality that places them in game can be seen in any pre-disaster map. If people are interested in duplicating these or want more detail I can make an in-depth step-by-step tutorial like I did with the lighting. Looking great! Especially interested to see what you do beyond that locked door near the locker room. And yes, I’d be up for linking my Sector B work to this for sure! That locked door is one of the things that I think connects to Dual Access, though, so at the moment it’s staying locked. I’ve filled out a lot of the area near the front office, though, and am extremely proud of it. Was having a hard time determining just what to do with this lab up here. 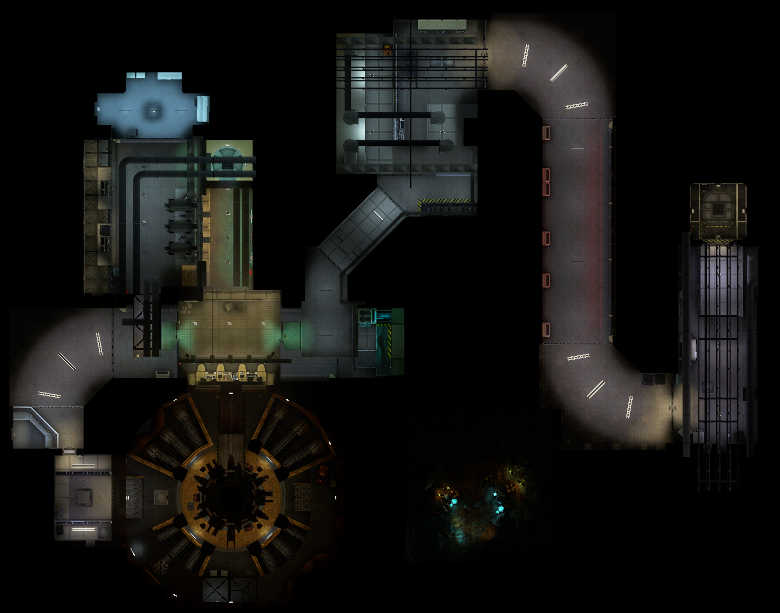 I’d like to make it accessible from the main body of the level, but cannot think of a particularly good way to do so without impinging on the sections seen in Decay’s Dual Access map which I decided I wanted to leave open for people making Decay remakes. [/align]It’s fairly obvious that the areas of the AMS complex seen in Decay are to the west of this map, because that’s (more or less) where all the locked doors go. Very early on I was considering giving the revolving elevator another, upper stop from which a hallway would circle around through some additional labs to the window lab and the balcony with consoles on it, but now that I am paying mind to Decay I no longer think that is a good idea. The area does fit very nicely into a Decay-avoiding template and so I don’t see reason to mess with it. So I think this area will actually remain inaccessible to the player at least from pd_c1a0b, and instead become part of a hypothetical pd_dualaccess.